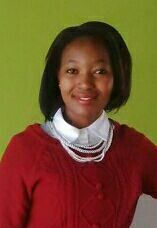 My name is Malimaene Bonolo Jeanett Morobe and I am a voluntary Assistant Physical Planner in Butha-Buthe Urban Council. I was first introduced to #MapLesotho in National University of Lesotho whilst a student, but that was a brief visit. 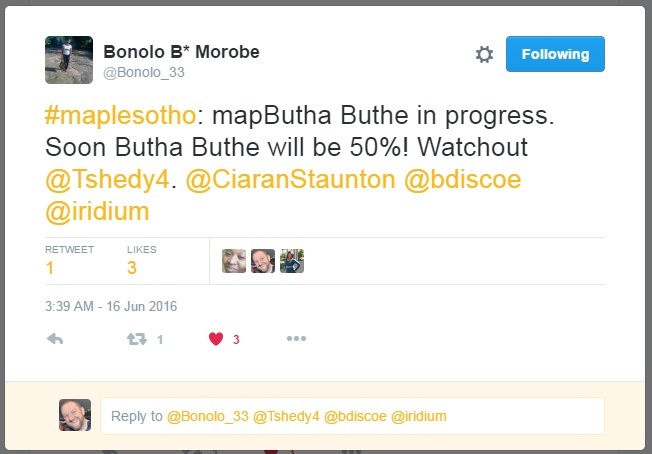 Last Thursday was my first proper #MapLesotho mapping day, and this is my very first blogpost. We braved the cold weather and gathered in the Butha Buthe Urban Council boardroom, which was booked courtesy of Mojabeng Tekane (Jababa to us) or Mojabeng on openstreetmap. I also want to mention Mme Lineo Mothae who joined us at the request of those who had been trained before. She really helped us a lot, as she is a big mapper with half a million nodes of work on #MapLesotho. Our morning started with a brief recap of what OSM is. Even though Butha-Buthe has been lagging behind for various reasons, we began our editing with great excitement and focus. As the day went on our work ethic and focus increased, by 01:00 o’clock we had moved from 1% marked as done to 3%.After lunch break we mapped with more vigour and got to 6% done . Among the tasks for the day, some participants posted their first tweets. On the second day we did more of the same, following Mme Lineo’s advice but she had returned to Maseru. Some were overwhelmed that they had not forgotten the ID editor and the tagging from their first contact with openstreetmap in February. Others were mapping for the first time. This is really good, and the skills we get are amazing. The overall consensus was that editing at district level was more fun and precise as all we are quite familiar with the surroundings. We are able to mark more details on buildings with this local knowledge. This phase two is fun because we also fix mapping done in the phase 1. We all want to do more of this, so the next step is to figure out how to have the internet more often.